In a unanimous bipartisan vote, the House Appropriations Committee on Friday approved a $40 billion state budget after finding about $250 million to fully restore promised education aid and 2% cost-of-living increases for state employees. Some cuts in health and mental health programs were also restored, winning the praise of health care advocates. It was the first time in several years that all the Republicans on Appropriations have voted for a governor’s budget. GOP members did resist some of the more drastic changes to Gov. Larry Hogan’s spending plan, including reductions in pension payments. “We’ve done it in a way that satisfies a bipartisan group,” Appropriations Chair Maggie McIntosh, D-Baltimore, told reporters. She noted that the committee preserved $450 million reductions in spending formulas and other cuts. This achieved a 74% reduction in the “structural deficit” in coming years, unlike Hogan’s 100% reduction. 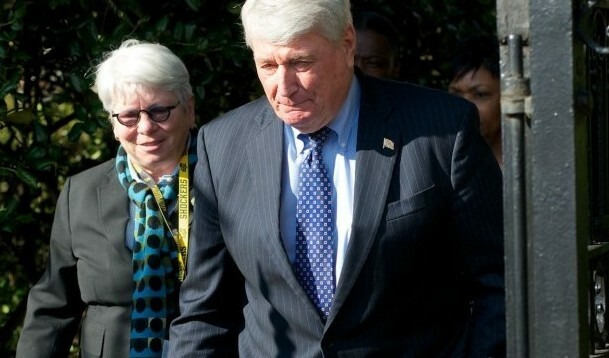 Hogan Budget Secretary David Brinkley gave McIntosh a kiss and congratulated her on a good job, though he later told reporters that the administration would have preferred some different actions by the committee. “We’re at half time” in the budget process, Brinkley said. “We would have liked to fund virtually everything” the committee chose to restore. “The good thing is they did it without tax increases,” Brinkley said. Left intact was a 2% across the board cut in agency spending on which both McIntosh and Senate Budget Chair Ed Kasemeyer had pressed for more details on how the administration would implement the reductions. As planned, the committee switched payments into the pension system to the full actuarial contribution but it did not totally eliminate a supplemental payment into the pension fund promised to state teachers and employees when their own salary contributions into the system were raised in 2011. The state will now pay an extra $75 million into the pension fund each year, not the $150 million expected next year or the $300 million initially promised. “We get to full 80% funding by 2023” as planned, said Del. Ben Barnes, D-Prince George’s, chair of the pension subcommittee. “I’m having heartburn for us not keeping our commitment,” Del. Mike McKay, R-Allegany. State Treasurer Nancy Kopp, chair of the State Retirement and Pension System Board of Trustees, expressed the board’s rather muted objections to the move.